The Teleporter is a four-channel LVDS transceiver module, designed to solve the problems associated with long-distance (up to 100ft/30m) transmission of I2S and DSD digital streams using standard CAT5/6 cabling. Using the dip-switches, each of the four channels can be independently configured as a transmitter or receiver. On onboard LT1763 regulator means you can supply the module with anywhere from 5-8VDC (5-6VDC recommended), offering excellent flexibility when embedding a transmitter in an existing high-resolution source. Because each channel of the Teleporter uses differential signals, it provides excellent common-mode rejection of external noise. A typical use for the Teleporter is extracting high-resolution DSD or I2S signals from an SACD player or other source, and transmitting them to a high-end DAC, such as the Buffalo. 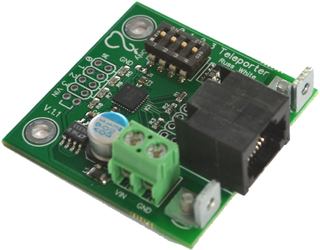 One Teleporter would be mounted in the source component, and be connected to the source signals via short leads, and tapping power from an existing low-voltage supply in the component. A second Teleporter is then mounted in you DAC's chassis, allowing the use of very short leads for the single-ended DSD and I2S signals connected to the DAC inputs. The Teleporter is designed to be either panel-mounted (using the two included angle bracket hardware) or mounted using our standard included standoffs. It measures 1.75" x 1.7" (approx. 43mm x 44.5mm).